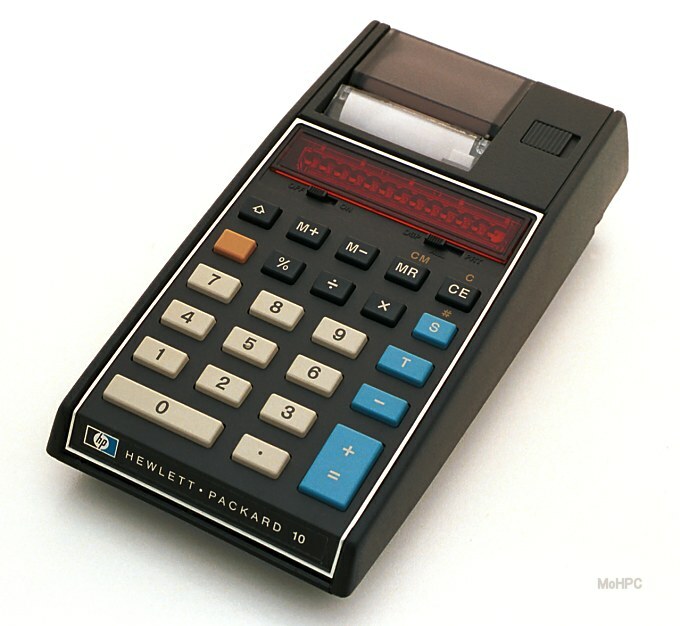 The HP-10 was probably the simplest HP calculator ever made. Not surprisingly its code name during development was KISS (Keep It Simple Stupid.) It was a handheld printing adding machine. The HP-10 was modeled after a standard desktop "10 Key" adding machine. Adding machines use their own style of logic. To add numbers on an adding machine, the user clears the machine (either by an explicit clear command or a previous total command,) enters the first number, presses the + key which adds it to zero, enters the second number and presses + again to add it to the previous result. For adding and subtracting, an adding machine is much like RPN, except that the first number is added to zero rather than Entered. For multiplications, the user enters the first number, presses the multiplication key, enters the second number and presses the = key. (The + key could then be pressed to add the product to the running sum.) So for multiplications and divisions, an adding machine looks algebraic. The HP-10, like some other adding machines, combined + and = onto one large key. It was always clear from the context whether the += key meant + or =. For example, if the user pressed Clear 30 + 4 * 5 += +=, then the first += was interpreted as =, and the second was a +, (ie 30 + (4*5)) yielding a total of 50. While this mixed logic, may seem strange to someone who has never used an adding machine, it was (and is) quite efficient for computing sums of products, and that's what order forms, inventory forms etc. are. 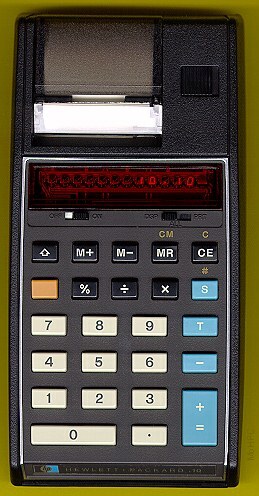 The HP-10 performed the basic 4 mathematical functions, as well as the percent function. It had one memory register that could be added to, subtracted from, recalled or cleared. S: Printed a subtotal. This printed the running sum and left the sum intact for further calculating. T: Printed the Total. Like S but also cleared the total for the next problem. (shift) S: Printed the display without subtotalling. (shift) T: Printed a row of "###############"
Like other adding machines repeat addition and subtraction consisted of simply pressing the + or - key the appropriate number of times. Also like other adding machines, the HP-10 had no scientific/engineering notation. "The human mind is a paradox. It can store billions of facts and make critical judgements to solve complex problems several times a day; but when it comes to using numbers, civilized man is ill-adapted to work with them. Ask a master chess player to multiply 137 x 23.64, and chances are he'll need a pencil and paper to figure it out. So, it makes sense in this electronic age to let machines do the arithmetic, the "number-sorting," and let people do what they do best--making decisions, understanding concepts, and thinking up new ideas. With your HP-10 Handheld Printing Calculator, you have formed a very advantageous partnership. The HP calculator deals with numbers quickly and accurately, leaving you free to concentrate on more important tasks. Since so much of our civilization does deal with numbers, isn't it smart to let a machine do such uninspiring work as adding columns of figures, calculating discounts, and performing long division? Over one million people throughout the world are already using Hewlett-Packard calculators to become more efficient and more productive." Front View (~47K) The white spot next to the power switch provides a visual indication that the calculator is on even when the display is switched off.